First National Real Estate agents are trained to assist you to identify your priorities, helping you to find the property that best suits your needs and budget. The advantage of dealing with a network like First National is that your new property can be found by your agent, working in collaboration with thousands of First National agents nationally. 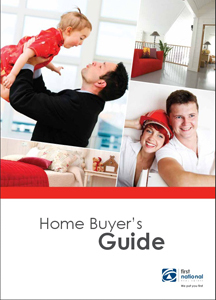 Click on the image to download your copy of the First National ‘Home Buyers Guide’. You can browse all our current properties for sale by clicking here.